Turning up in the correct aerial hoop kit will make most moves more enjoyable and less painful. It will mean you are able to achieve more and train in a safe environment for yourself and fellow students. 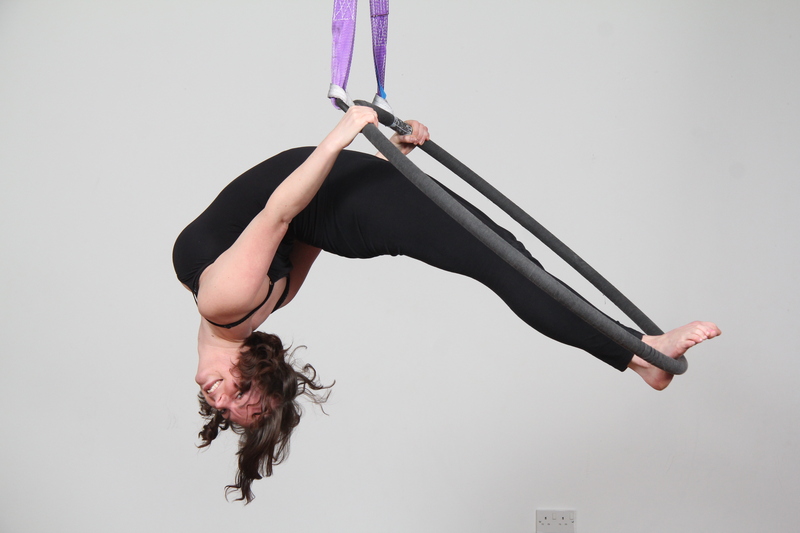 Here is some useful info on what to bring with you to your first aerial hoop class. Clothing that is close fitting is ideal for your Aerial hoop kit, baggy or flared bottoms or tops can get caught in the rigging or tangled when training which can be a hazard to you and others so avoid these. Backs of knees, elbows, wrists, backs and hips are prone to bumps and bruises when training, to avoid this wear layers, for example two pairs of leggings, leg warmers, long socks, tight fitting shorts over leggings, will all give extra protection to parts of the body prone to bumping. Ideal items to wear are leggings, tight fitting shorts over the top, leg warmers, T shirt, leotard or swim suit or two pairs of leggings. We often work in bare feet for safety treasons, but when starting it can be handy to wear socks to protect tops of feet at first. Your hands will swell when you first train and it can be helpful to wear gloves to protect hands, these are personal preference, and not usually essential for first lesson, its something that is considering buying if you repeatedly struggle with painful hands. The gloves we recommend are leather, fingerless gloves such as weight lifting gym grip gloves. You can purchase these at most gym/sports stores. For safety and durability we must minimize the defects in the equipment used for the class.Therefore, we ask that you remove jewelry, watches and anything else you may be wearing that could get caught in the equipment or snag or cut it. Also your hands may swell slightly after class due to the nature and intensity we use our hands for gripping in class, another reason to remove rings and jewellery prior to training. Long finger nails or toe nails may snag the equipment and cause you injury, please keep them trimmed. Please tie back hair to prevent being caught in equipment and becoming a hazard.